Kisanganj, April 14: All India Majlis-e-Ittehadul Muslimeen (AIMIM) president Asaduddin Owaisi on Saturday said that the Love between Prime Minister Narendra Modi and Chief Minister of Bihar Nitish Kumar is stronger than Laila-Majnu. Owaisi made this statement while taking a jibe at the alliance between Bharatiya Janata Party (BJP) and Janata Dal (United). 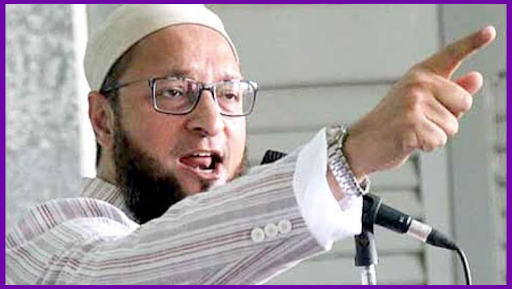 AIMIM Chief Asaduddin Owaisi Confident of 4th Win from Hyderabad; BJP, Congress Allege He Indulges in Divisive Politics. "The love between Nitish Kumar and PM Modi is very strong. It is stronger than that love of Laila-Majnu. When the love story of Nitish Kumar and PM Modi will be written, do not ask me who is Laila and who is Majnu between the two. You decide," AIMIM chief said while addressing an election rally in Kishanganj. He further said when the love story will be written then instead of love, hate will be composed. "It will be written since that time they came together, there is tension between Hindus and Muslims in India," he said. Mob Lynching is Narendra Modi's Legacy, Says AIMIM President Asaduddin Owaisi. In Assembly Elections 2015, JD(U) contested in allaince with Indian National Congress and Rashtriya Janata Dal (RJD). But later joined hands with BJP to run the government. In 2019 Lok Sabha Elections, JD(U) and BJP will contest 17 seats each and six seats will be fought by Lok Janshakti Party (LJP) out of 40 parliamentary seats. Owaisi also hit out at Minister for Women and Child Development Maneka Gandhi over her remark on Muslims. Asserting than PM Modi's 'Sabka Sath, Sabka Vikas' is a lie. "Maneka Gandhi scolds and threatens Muslims that if they do not vote for her then they will not get jobs... Prime Minister's slogan 'Sabka Saath, Sabka Vikas' is a lie," he said.